Dear El + Em: It's The Most Wonderful Time... For A GIVEAWAY!!! The AMAZING Andrea from Glam Hungry Mom is hosting my first very special giveaway on her blog....check it out, and you could win a few of MY FAVORITE things! This is clearly another step for me in the "blog world" that I am very excited about! What a fun way to thank you all for so much support in such a short period of time! Seriously, thanks a bunch...and of COURSE thanks to Andrea! 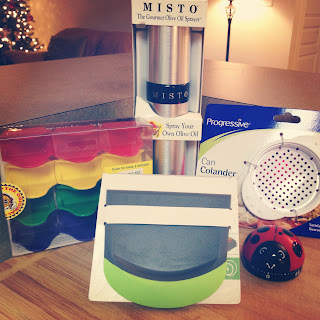 Here is what I am giving away...just a few items I couldn't live without! *Go to Glam Hungry Mom for more info! I'm so excited for you and this giveaway! Those are some items that I would loooove to have in my kitchen! Thank YOU for doing this giveaway with me! I have loved getting to know you! These are all awesome items, I'd love to try the misto! I always pour way too much olive oil when I do it myself. I've always wanted to try the misto! Wellllll I have to say the Misto, ladybug, and the can colander could be my most favorite items!!! I'd like to try the taco stands...my tacos are always so messy, maybe this will help! Thanks for the chance to win, I'm excited to follow you!! Woohoo....this is so much fun, you all ROCK!!! !